All roll-off dumpsters are not created equal! That is why we are proud to be Affordable Dumpsters, servicing Albany, NY and the surrounding capital district area. We are the ideal roll-off dumpster service for residential customers in Saratoga, Schenectady, Troy and everyone in between that is looking to rid their property of garbage and trash. You have probably noticed our bright red dumpsters strategically placed in driveways everywhere within a 25 mile radius from Albany. Why not give us a call next time you are looking move yourself or a loved one, do a small home renovation project or just clean out the clutter and need a dumpster for household junk. We have dumpsters right for every project indors and out. Trash and refuse removal is our business. We are experts at determining just the right size dumpster. Our roll-off dumpsters are small to medium sized walk-in back gate units that are quick and easy for you to load. No matter what you are getting rid of, we have the perfect sized dumpster for your cleaning or renovation project. We would be happy to speak with you about your dumpster needs. Unlike some of our local competitors that try to oversell you with a dumpster size that is too big, we only want you to pay for exactly the space you need. Once we know if you are cleaning out one room ,a garage or basement, or an entire apartment or house we can determine if you need a 6,8,10,12,or 14 cubic foot dumpster. 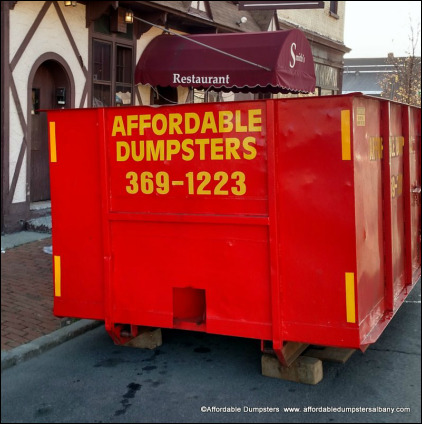 Affordable Dumpsters is happy to serve the entire capital district area. You will find our dumpsters in use all around Albany, Schenectady, Rensselaer, and southern Saratoga Counties. We will provide our neighbors with roll off service as far north as Saratoga Springs. Do not accept service from impostors that may claim to be Affordable Dumpsters. 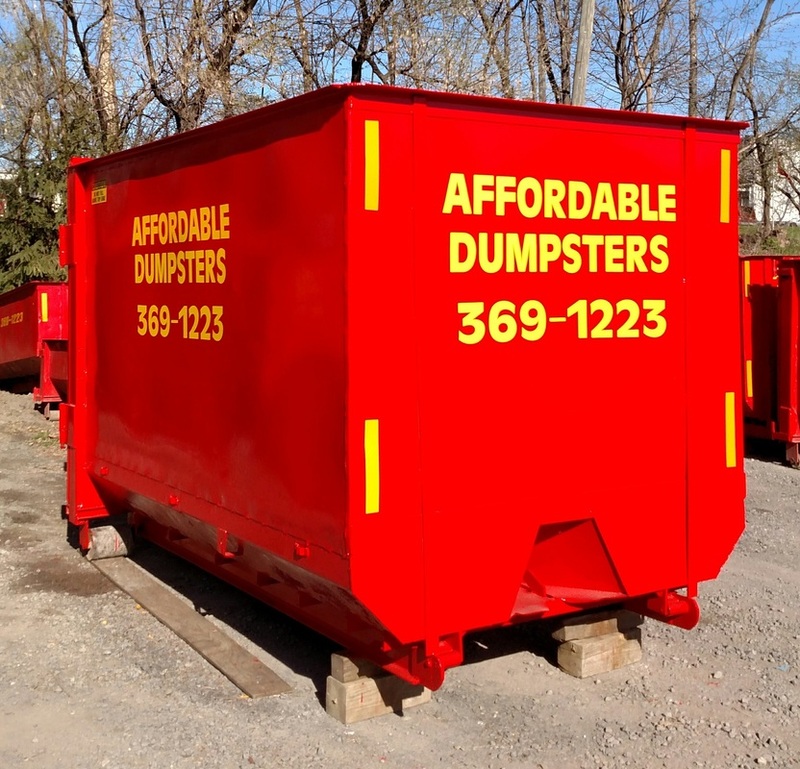 Our refuse containers are bright red with our name and phone number proudly displayed on every roll off dumpster. You deserve the best service customer service in Clifton Park, Niskayuna, Glenville, Schodack, or what city or town you live in. You can check our customer reviews on Google+. Make sure you get the best by making sure you are getting one of our big red dumpsters. Don't be fooled. You deserve the Dumpster best customer service in the Albany New York Capital District. Make sure you get a roll off like this. We do everything the big guys do only we do it better. We offer friendly, honest, personalized service that you will not get from a huge company like County Waste. Our customers are not just an invoice number. We are proud to say that we have a large following of satisfied repeat customers that send us referrals. Customer satisfaction is how we have built our business over the years. And we will maintain our high standards going forward. We take great care not to damage your property. Did you know a dumpster full of debris sitting in a driveway in Albany, Schenectady, Troy, Saratoga or anywhere in-between can weigh thousands of pounds? Unless the dumpster is placed properly on wood planks, serious damage can be done to your black top. Affordable Dumpsters always guarantees that we treat your property like it were our own to assure that no harm comes to any of your property. We offer small project contractor service.